Carolina Panther QB Cam Newton couldn't lead his team to the playoffs this year, but that doesn't mean he won't appear on television during the NFC Championship game. Let us explain. 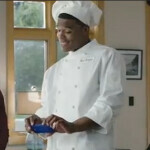 Newton currently starts in four different commercials for Windows Phone 8. Each one is basically the same, but with a slightly different ending. Microsoft wants you to vote to select which one of the four will be aired during the FOX pre-game show for the NFC Championship game, 3PM on January 20th. To vote on which catchphrase you like best at the end of the ad, simply tweet using hashtag followed by the name of the ad you liked best. In other words, the choices are #PoundCake #FrenchFries, #Moneybags, #CashingOut #CatchtheOop or #PeanutButter #Jelly. Voting ends next Friday, January 18th at 12 noon EST. Currently, the #PoundCake #FrenchFries leads with 53% of the vote, followed by the 22% for #Moneybags and the 16% for #PeanutButter #Jelly. With only 9% of the votes counted, #CashingOut #CatchtheOop brings up the rear. At this point, PhoneArena has done a complicated statistical analysis using a unique and proprietary algorithm and we can now project that #PoundCake #FrenchFries will win. Actually, we're just guessing. That was the funniest one....lol. Article should be titled with "starring", not "staring". Missing an R, changing meaning from "featuring" to "long look". What did u think of the broncos/ravens game? itS ME OR IN THE THIRD VIDEO AT THE END MAIN GUY IGNORE THE SECOND GUY. YOU COULD ALMOST SEE THE OTHER GUYS FACE LIKE XD.